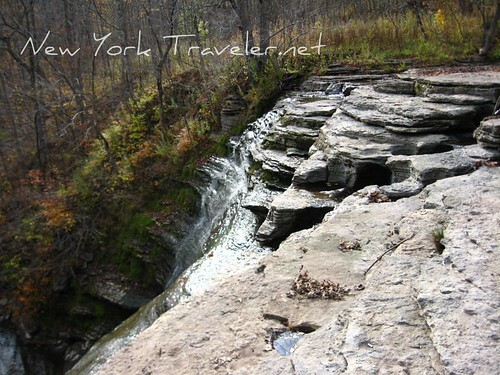 We’d explored some of the trails and a small stream, and finally made our way down the small gorge to the Pixley Falls. 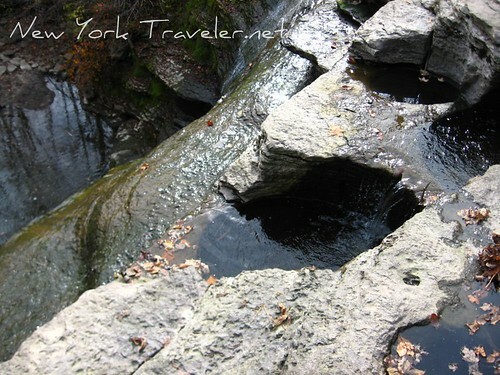 The water was thin for a waterfall, although it was pretty obvious that a lot of water had once gushed across this chasm. The rock strata is just amazing to me. The setting is so peaceful and the sound of the water so soothing that I could have watched it for hours. The photos cannot express smell, though. The place smelled like dead fish. There were no fish that we could find (and we did look), but I think the smell came from stagnant water. The water, rushing down the waterfall, pooled below and didn’t really have any place to go. 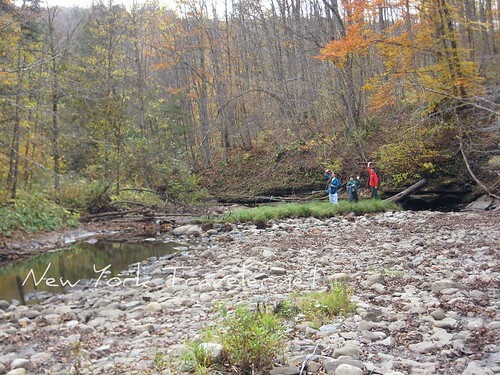 We were able to stroll along the creekbed where the water had, long ago, raged. Small pools of slightly green water sat at out feet. We followed the creek for a while. It was muddy in some places. 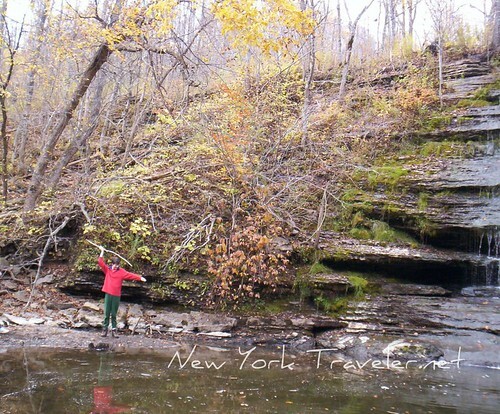 The watercourse, like so many areas in Upstate New York, is flowing across limestone. 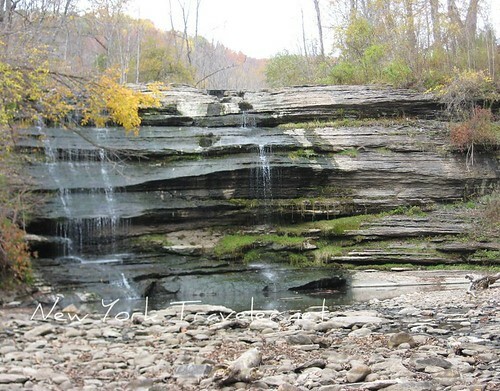 Limestone suffers severe erosion with continual water activity like this, so the streams and waterways are always “changing their minds.” The stream, which had once coursed down the falls, was changing slightly. 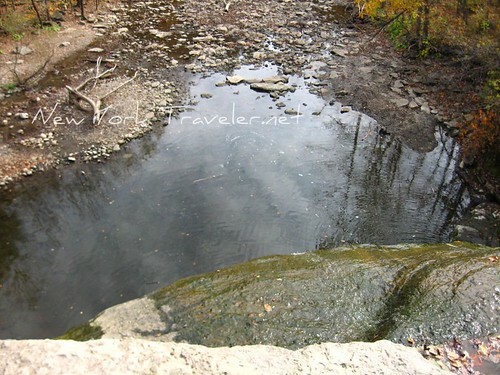 As we walked down the creekbed, we saw more water, coming from a different stream that had formed. We made our way back up to the top and I discovered a small path that led to the top of the falls, 50 feet above where we had just been. Good thing I’m not afraid of heights! I told the kids they had to stay back, but I ventured to the edge to snap some photos of the top of the waterfall. 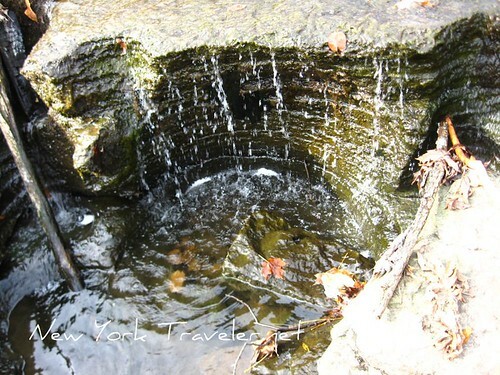 I thought it would be cool to have a picture of the water going down at the bottom and the top! Here I am, looking straight down where I was looking up previously. I stepped back and noticed all these circles at my feet. When I stepped back, I found the neatest thing! 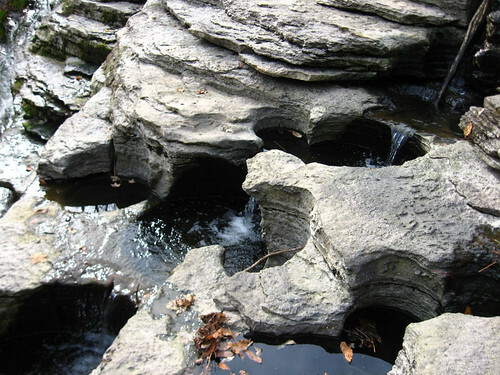 The water coming down the upper creek (before it fell down the waterfall) has carved dozens of circles into the limestone. It was like a little fairyland of sorts, it was beautiful. And here’s a closeup of a circle. 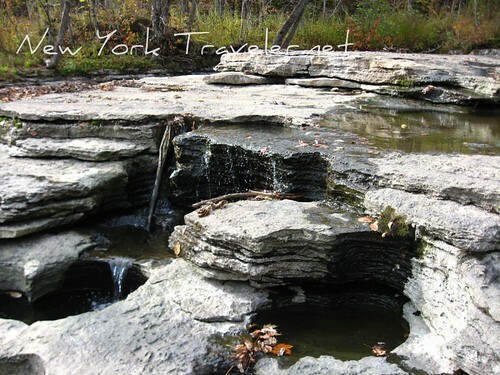 I found it awesome that the water formed perfect circles, sometimes perfectly concentric circles, as it flowed down the limestone and then down to the pool below. It was all sparkly and wonderful up here. I am still kind of stunned by its beauty, even now. If you’d like to see a simple video I took of the waterfall, I posted it here. How gorgeous! I am originally from MA and miss the scenery and beauty of New England. This is just lovely! Sorry about the odor… we can’t have everything, you know! hahaha! you’re correct, the dozens of carvings on top of waterfalls are just gorgeous, i love boulders, and i always am fascinated by the power of water in carving stones. and i like your side view picture of waterfall from the top. sorry to hear about the odor, but then, you have such a wonderful sight too. Oh my what a wonderful share. these are fabulous pictures. It reminds me of what we called ledge in Maine. Once again yet another visit here!! How pretty!!! How pretty! 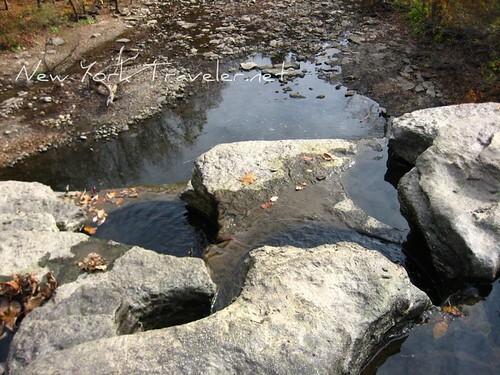 I can hear the water trickling over the rock outcropping and I can smell the odor of fallen Autumn leaves. What a wonderful adventure you shared. I have a Halloween Treat for you on my blog today! Scroll down beyond my short story. 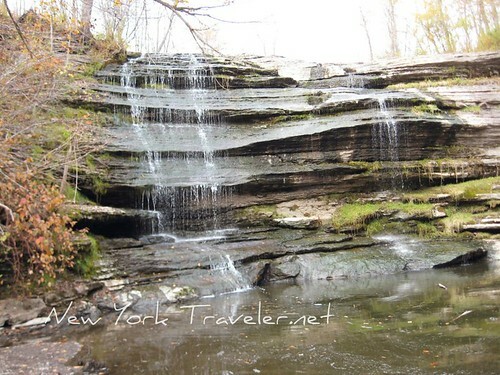 Those pictures of the Waterfalls are stunning, thanks for sharing them! Wow, nature is really amazing. I love waterfalls too. 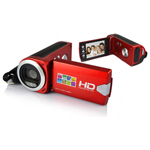 It looks you had a great time exploring the place, the pics are great too. looks like this is our next stop! thanks for the photos! now we are sure we are going.